Usually animals have to do something outrageous before their people take action and decide it’s time to have a session. In most cases, an ongoing situation is creating undetected discomfort or stress in the animal’s daily routine. The animal’s attention-getting behavior usually works best if the destruction involves something expensive or of emotional value to master or mistress. Moose knew how much his person loved her garden and her plants, so one day he chewed and destroyed a rare and newly transplanted bush. He got his appointment very shortly after this “misdeed.” Since Moose was such a responsible dog in every way, his behavior was really out of character and very distressing to his person. She had to find out what was going on. Moose, accompanied by his person, climbed up the steep stairs to the first landing where my office is located. He slowly walked in and I immediately felt a little intimidated by his presence. He was big, dark brown and surly – a dog not to be messed with. His gleaming black eyes, partially concealed by wrinkles of skin, sized me up. After a short time, the tension evaporated and he became relaxed and congenial, fitting the description I had been given. This case study became a personal landmark. I learned, once and for all, to trust my abilities and avoid second-guessing information I received intuitively and telepathically. It also provides insight into how a dog experiences his genetic heritage, in this case the character traits bred into a Shar-Pei. Hi. My name is Moose, “The Dog With the Snort.” I am very very happy today because I am with Judy. I always want to protect and guard her, but she is so happy-go-lucky that she doesn’t even realize what my job is. I am here to be ferocious and guard. I impress people with my color and my sturdiness. I am here to be slightly menacing but not too much. Just enough to put people on their guard so they do not try anything. I am very invested in protecting Judy because I feel she is just too trusting with everything and everyone. I am very pleased that I am able to communicate this because I have not been able to really be myself. I am not a cuddly lovable creature, I am SHAR-PEI and that means I am diligent and smart. I must be given jobs that are up to my abilities. I need to guard the house and everything in it. I need to guard the car if I’m in it. I need to guard the yard and the garage. Especially the garage. They ALWAYS leave that door open and it makes me very nervous. B: Do you feel alone? No, I do not feel alone. The one who lives with Judy is there often, but I am Judy’s dog, and as Judy’s dog I am totally devoted to her. She must understand this and take this into account. I just hate being left alone in a room while they are somewhere else. How on earth can I protect them? They must realize this because it is causing much stress for me. They just flit here and there without any consideration for all the attention and care I am putting into my job. B: Why have you come here? I have come here to be a strong, willing and able dog. To protect and guard a human being and all his or her possessions. I have come to be a strong, self-assured, self-sufficient dog. This happens often – I get gas and my stomach needs the relief. I do not know if it is the food or not. B: What have you come to teach? I have come to teach that a dog’s life and mission in life are as important as a human one’s are, and that we are evolving hand-in-hand with the humans we choose to live with. Judy is wonderful – I love her and respect her as my mistress. B: Would you like to spend more time with your person? No, I do not need to be with her more. I need her to be with me in a slightly modified manner. This you need to talk and discuss with her. B: Is there something wrong with your house? No, I love my house. The only problem is the garage – they put my food out there. I’m always concerned about thieves. Before I came in as a Shar-Pei, I was a Shar-Pei. Shar-Peis rarely change consciousness. The breed is so defined; the consciousness gets used to the characteristics and wants to evolve within Shar-Pei parameters. I lived on farms and, yes, I did guard, but not herd – usually I was all by myself and given great responsibility. In this lifetime I have to get used to having less responsibility – but the responsibility is in my genes. This is what Judy needs to understand. Most of Moose’s information was self-explanatory and confirmed my initial impression. He used his body language to put me “on guard,” and I got the message very clearly. The session revealed Moose’s stress derived from his continual efforts at guarding people who were oblivious to danger and the need for watchfulness. They made his job very difficult by going from one room to another without warning and by leaving the garage door open all the time. Clearly Moose was at his wit’s end and needed to let his people know he was a guard dog, not just a pet. My greatest lesson came with the open garage door information. The session was held in my office; I did not know if Moose lived in an apartment, condo or house. I knew even less if whatever type of home he lived in had a garage, a carport or just a parking space with a number on it. I was already a bit disconcerted by the difference between the person’s awareness of the dog and the dog’s awareness of himself. They were living in a parallel universe of sorts. In seconds the doubts crowded into my mind and my mental thoughts tried to lure me away from the task at hand. I got horrible feelings of dread and embarrassment as I projected how stupid I would appear if it turned out there was no garage and no garage door in the home. All of this took place in a flash and seconds later my attention was back with Moose. His communication would be taken down exactly as I received it and would be read back to his person verbatim. Embarrassment or no embarrassment, I would honor the dog and trust my ability to receive his information correctly. After a while Moose’s person returned to the room and I read back to her what he had shared. “My goodness!” she exclaimed, “I leave the garage door open all the time. I thought he enjoyed being able to see outside when I’m out working in the garden.” Furthermore, Judy said, Moose and her boyfriend had stayed at the house while she was out of town the previous summer. Rats had gotten into the garage, gnawed the trim and wires of a vintage Corvette, and stolen dog food stored just outside the kitchen door in the garage. Moose had been very upset about this incident. As a Shar-Pei he was knowledgeable about guarding in general, and guarding against food theft in particular. Here the rats had been having a party with his food right under his nose while the human took no notice. 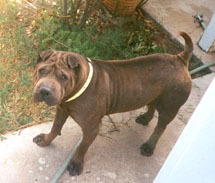 I also learned a Shar-Pei carries responsibility in his genes, and dogs of such a specific breed often reincarnate (and animals DO reincarnate) within the species because, over time, they have integrated the characteristics at a deep cellular level and feel an affinity with the overall consciousness of a particular breed. I have records of similar comments from Basenjis, Tibetan mastiffs, Akitas, German Shepherds, Rottweilers and other old working breeds. It was clear Moose needed Judy to acknowledge his responsible guarding nature, whether she felt she needed a guard dog or not. He needed her help and awareness so his job could be made easier. Harmony was restored in Moose’s life. However, he succumbed to an internal ailment and died two years later. He had mentioned stomach gas in the session; perhaps this was a symptom of what was brewing inside. We’ll never know. Overall, Moose led a happy and fulfilled life devoted to his person whose only shortcoming, from Moose’s perspective, was to be too trusting, outgoing and friendly with strangers.